Enjoy a lovely soulful dinner, live performance by JeRonelle McGhee who captivated us all with his performance of “This Woman’s Work” on The FOUR. 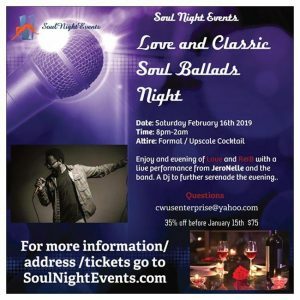 Then let the music take your mind on the dance floor… All tickets for this Soul Night like all our events are pre-sold and registration closes early. Don’t miss out get your tickets as soon as you can. It is going to be one of New York’s most anticipated event of February 2019.